To Raleigh, she brought with her Oh Honey and Jukebox the Ghost. Both openers brought something warm and fun to the stage, but Jukebox the Ghost in particular rocked. I didn’t have an extensive knowledge of them before last night, but they made me a fan. Along with their songs, they covered “Don’t Stop Me Now” by Queen and it was awesome! They brought an energy to the stage that pulsated through the crowd and made audience members take notice. If you’ve seen Ingrid Michaelson live before, you know that she’s an incredible performer. When she plays and sings it is obvious that she has something to say through her songs and you don’t want to miss a minute of it. Her voice can be light and airy hanging on to the softest notes and be charged and powerful in the next song, or event the next verse. She interacts with the audience and makes the concert even more fun, and makes each stop along her tour a unique experience for concert goers. Last night, she brought up an audience member (selected from submitted videos) to sing “The Chain” with her and guitarist Allie Moss which was a fun experience not only for the guy who got to sing on stage with her, but for the whole audience. 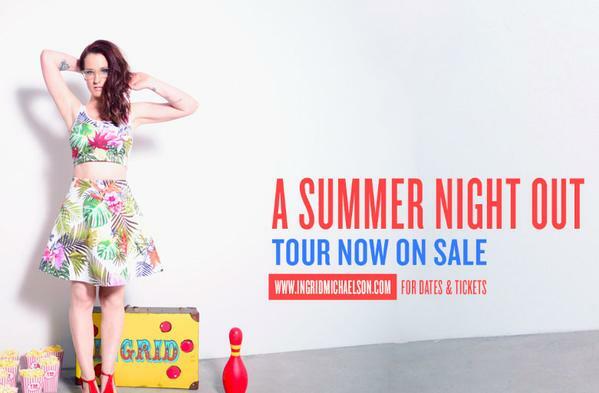 Bottom line, if you have the chance to see Ingrid live on the A Summer Night Out Tour, don’t miss the opportunity! If you live in Raleigh and did miss this concert, there are still many more great shows coming to The Ritz this summer! Check out their event schedule for details!